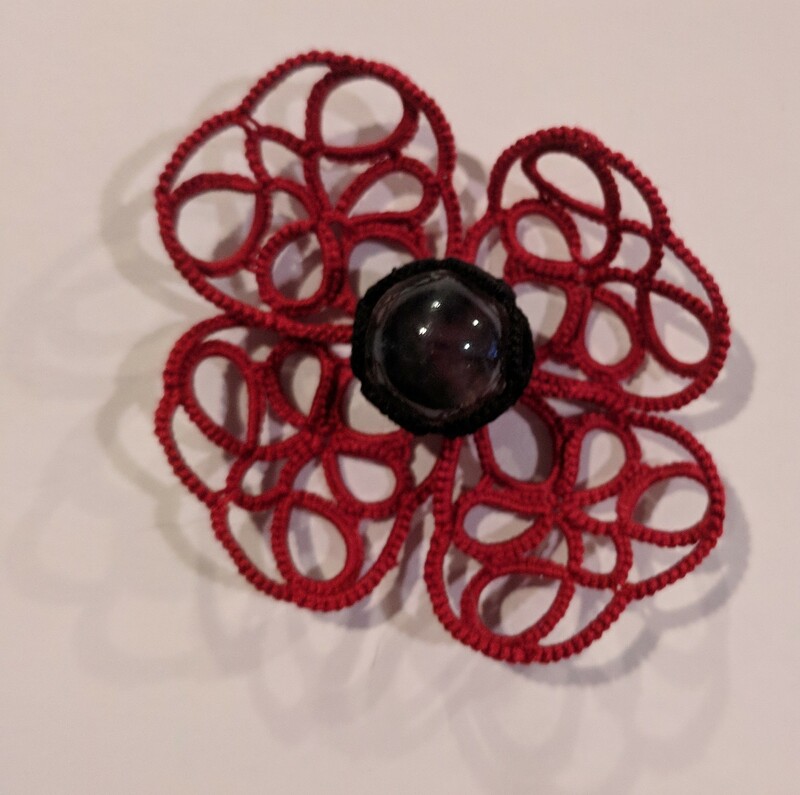 In this post I continue with the photo-tutorial for the squared flower inspired by Sardinian filet lace. In the previous post there's how to tat the central part; it's not really a two rounds pattern because the inner part flows into the outer part. 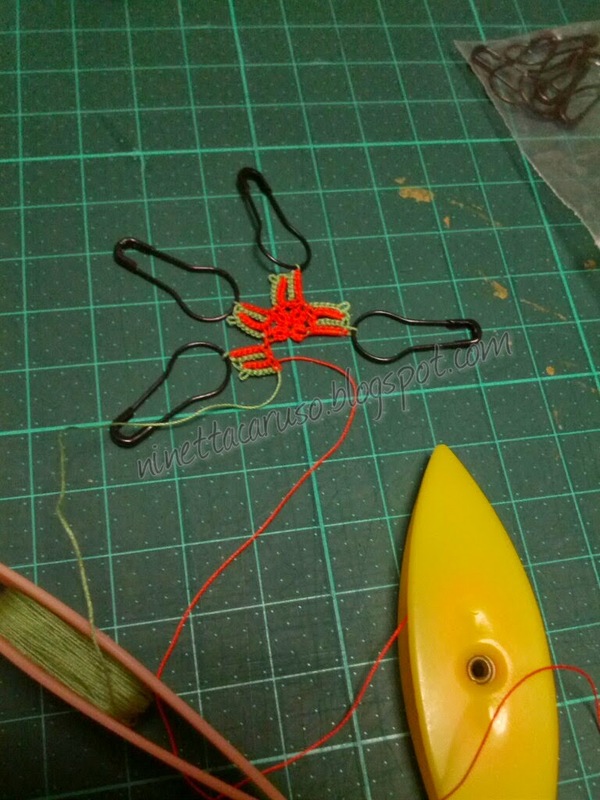 For me SH1 is the green thread, SH2 the orange. Sorry for the bad quality of these photos, orange became red! My gauge with size 80 thread is 14ds per centimeter. 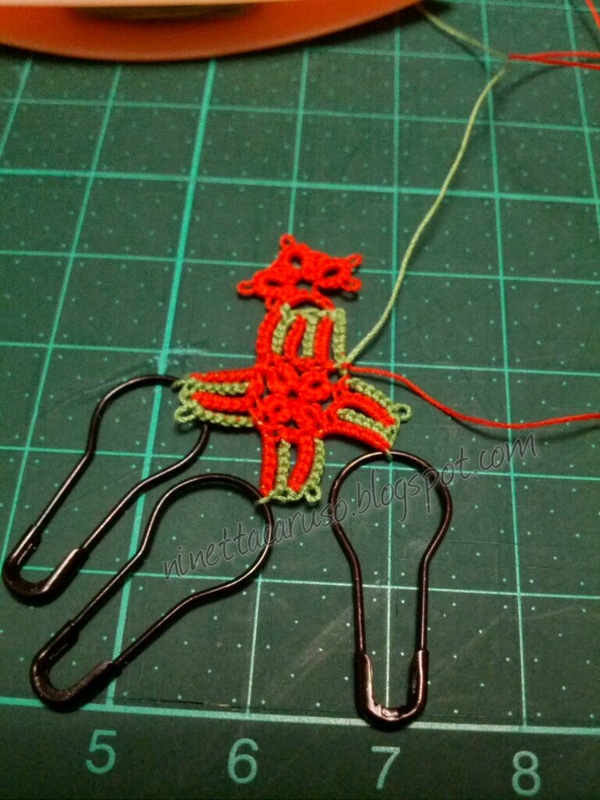 Coiless safety pins are very useful as stitch markers too, but I feel as I can't tat block tatting in the same way without them. 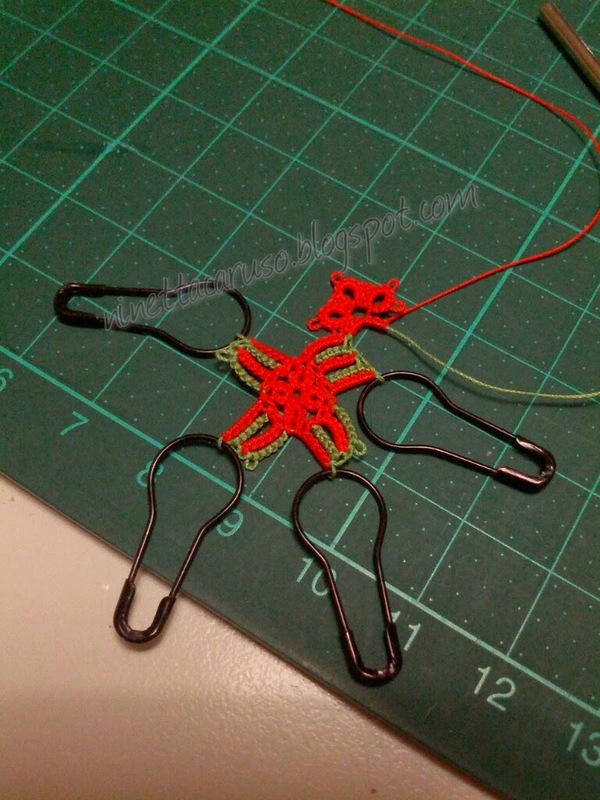 I put the pin just after the last ds in the first chain of block tatting because I needed a picot exactly there. 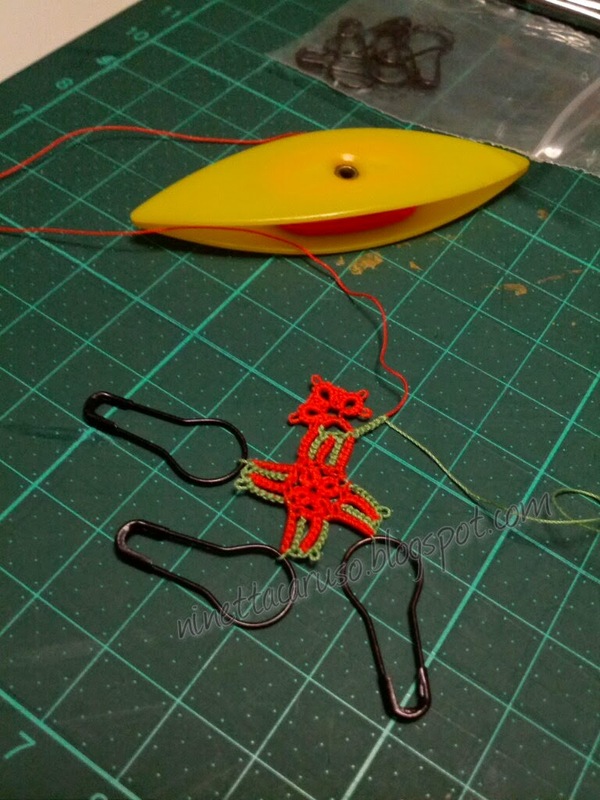 After four repetitions, I made a normal join to the starting point, between first ring and first chain, leaving a very short bare of SH2 thread, needed for the closure of the pattern at the end of the outer round. Do not reverse work. 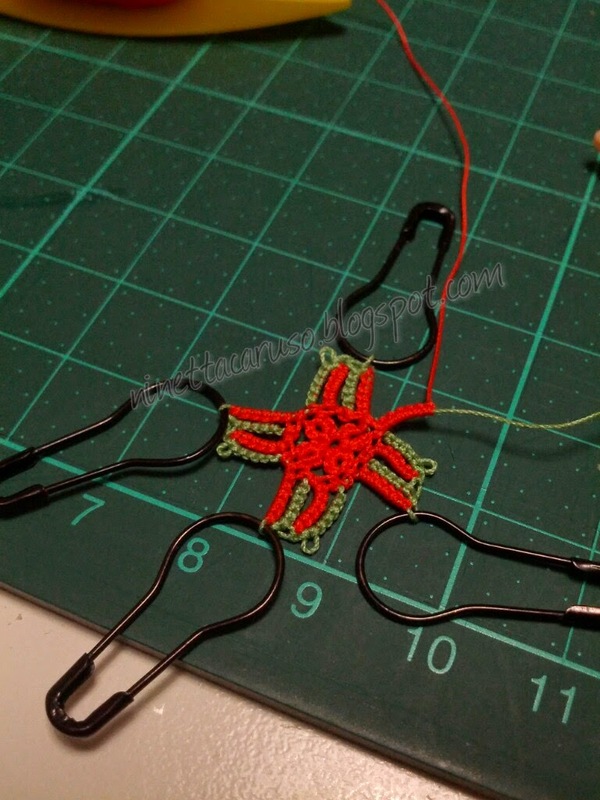 Then, you see in pic.2 that I changed the direction of tatting, there's no need of any shoelace trick here because the next chain will be part of the block tatting below. Make a lock join (with the green thread) to secure this chain. Then make a chain of 3ds and with SH2 make a trefoil: ring 3-3-3-3; ring 3+3-3-3; ring 3+3-3-3; back with SH1, make another chain of 3ds. I took the pin out at this point. Lock join with SH1. 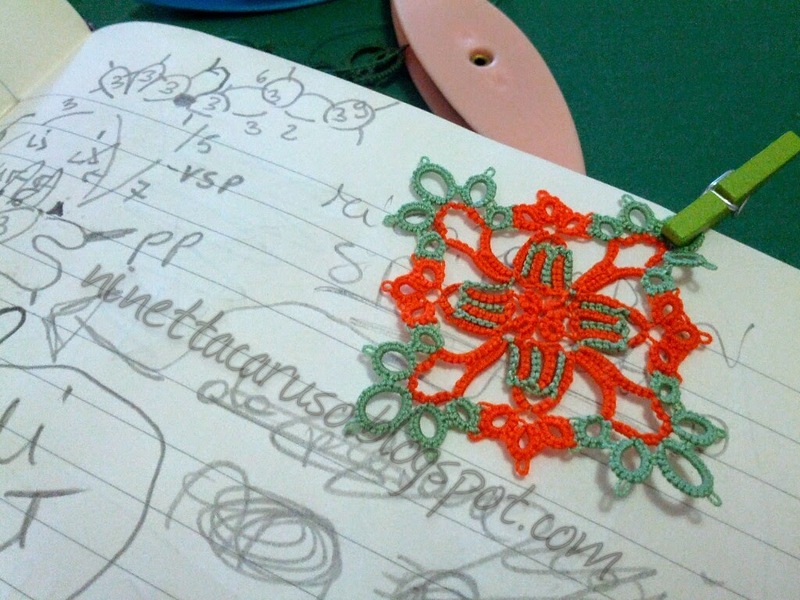 The last chain of the block tatting that is below the trefoil has been done in reverse tatting, the green thread in the photo. A lock join (with the green thread) blocks it in position. Try to join to the green bare thread under the central ring. And then... to be continued in the next post! Great design! I see how you did it - very clever indeed. Love your notes! You need a gold star for this work and I love going to you sight when I am working on things you tat so perfectly! Thank you, you're very nice, I had a lot of fun with that, tatting clockwise then counterclockwise was such a fun! Chiacchierino: Ok! But Facilissimo: no! Beautiful and clever, yes!